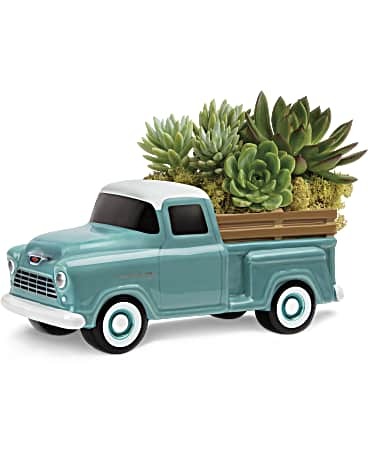 Perfect Chevy Pickup by Teleflora in Los Angeles CA - California Floral Co.
Give dad the perfect pick-me-up on Father's Day with this perfect pickup! Hand-painted and hand-glazed, this ceramic Chevy hauls a beautiful bounty of living green echeveria plants. It's one of the ways we're commemorating the 100th Anniversary of Chevrolet Trucks! 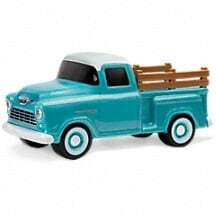 This hand-painted ceramic truck is a replica of the classic '55 Chevy pickup, created exclusively for Teleflora's Flowers-in-a-Gift collection. General Motors Trademarks used under license to Teleflora.